ST. PAUL, Minn.–(BUSINESS WIRE)– St. Jude Medical, Inc. (NYSE:STJ), a global medical device company, today announced U.S. approval of BurstDR™ stimulation, a physician-designed form of spinal cord stimulation (SCS) clinically proven to provide superior outcomes for patients with chronic pain over traditional SCS therapy. With FDA approval of BurstDR stimulation, which is exclusive to St. Jude Medical, the company aims to help patients find relief from their pain and suffering while also providing patients a better experience with their chronic pain therapy. Chronic pain is a complex and challenging condition for physicians to manage, and a heavy burden for patients who find their lives profoundly limited by their pain. Many patients often move from treatment option to treatment option seeking pain relief, only to find a partial or incomplete response to therapy. Fortunately, SCS therapy can transform quality of life for many people who are otherwise unable to find relief from chronic pain. BurstDR stimulation from St. Jude Medical has been clinically proven to improve upon traditional SCS by generating superior pain relief. With BurstDR stimulation, St. Jude Medical is also helping physicians address their patients’ physical and emotional responses to pain and reduce overall pain and suffering as measured by patients who reported their responses to therapy with BurstDR stimulation through visual analogue scale (VAS) scoring. St. Jude Medical’s proprietary BurstDR stimulation works differently from other stimulation designs, utilizing intermittent “burst” pulses designed to mimic the body’s natural nerve impulse patterns. 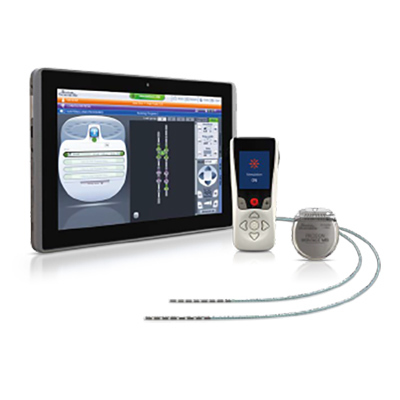 While other companies have tried to mimic burst patterns, BurstDR stimulation from St. Jude Medical is the only approved form of burst stimulation to have been evaluated in a large scale, multicenter randomized controlled clinical trial. The St. Jude Medical BurstDR stimulation was introduced after nearly a decade of research and study in collaboration with Prof. Dirk De Ridder, who filed the therapy’s initial patents in 2004. BurstDR stimulation was evaluated within the SUNBURST study, a prospective, randomized multicenter study which confirmed BurstDR stimulation offered superior pain relief over traditional SCS and that the therapy was preferred by most patients over traditional SCS therapy. In addition, BurstDR stimulation from St. Jude Medical has been studied in a large number of international real world studies that have helped the company assess the benefits of the therapy in patients worldwide. With FDA approval of BurstDR stimulation, patients receiving new implants of the St. Jude Medical Proclaim™ Elite and Prodigy MRI™ spinal cord stimulation systems will have immediate access to the new therapy. Combined, the Proclaim Elite SCS System and BurstDR stimulation offers patients the advantages of the St. Jude Medical Invisible Therapy™ portfolio and an entirely recharge free option, allowing patients to focus on their lives instead of their pain. 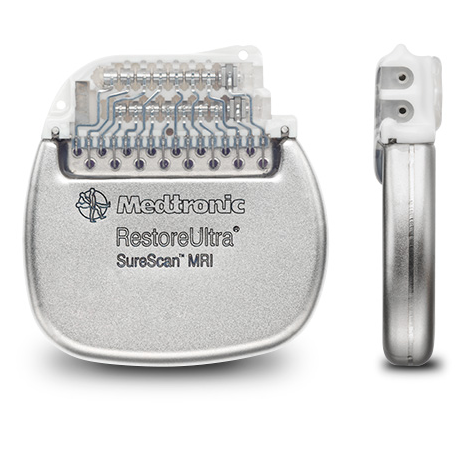 In addition, patients previously implanted with upgradeable Protégé™ and Proclaim SCS systems will soon be able to upgrade their systems to deliver BurstDR stimulation without additional surgery. Chronic pain affects approximately 1.5 billion people worldwide, more than heart disease, cancer and diabetes combined. The condition can negatively impact personal relationships, work productivity and a patient’s daily routine. St. Jude Medical is an international leader in the development of chronic pain therapy solutions and the only medical device manufacturer in the world to offer radiofrequency ablation (RFA) and spinal cord stimulation (SCS) therapy solutions including BurstDR stimulation and stimulation of the dorsal root ganglion (DRG) for the treatment of chronic pain. This news release contains forward-looking statements within the meaning of the Private Securities Litigation Reform Act of 1995 that involve risks and uncertainties. Such forward-looking statements include the expectations, plans and prospects for the company, including potential clinical successes, reimbursement strategies, anticipated regulatory approvals and future product launches, and projected revenues, margins, earnings and market shares. The statements made by the company are based upon management’s current expectations and are subject to certain risks and uncertainties that could cause actual results to differ materially from those described in the forward-looking statements. These risks and uncertainties include market conditions and other factors beyond the company’s control and the risk factors and other cautionary statements described in the company’s filings with the SEC, including those described in the Risk Factors and Cautionary Statements sections of the company’s Annual Report on Form 10-K for the fiscal year ended January 2, 2016and Quarterly Report on Form 10-Q for the fiscal quarter ended July 2, 2016. The company does not intend to update these statements and undertakes no duty to any person to provide any such update under any circumstance. Source: St. Jude Medical, Inc.
Providing safe access to Full-Body MRI Scans*. 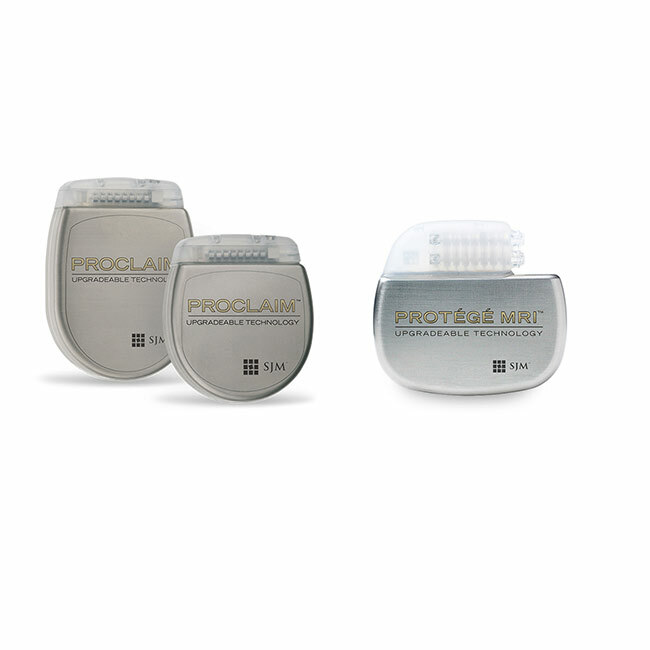 Precision Montage™ delivers Multiple Wave forms, all powered by Illumina 3D. No longer compromise Pain Relief for Full-Body MRI — Precision Montage™ MRI couples the most advanced programming proven to provide excellent pain relief and Full-Body MRI. The AVISTA™ MRI LEAD is the only lead designed using Heat canceling technology for safe access to Full-Body MRI Scans. the layers of the lead were engineered to work together to cancel out the RF waves that cause heat, creating a safe environment for MRI scans. this unique construction was also designed for optimal steering and durability. CLIK™ X MRI ANCHOR – Quick. Simple. Secure. The CLIK™ X MRI anchor is streamlined to support the lead transition into the fascia with Quick, Simple, and Secure lead anchoring. this anchor is constructed with radiopaque material so it can easily be identified as an MRI Conditional System when imaged. ST. PAUL, Minn.–(BUSINESS WIRE)– St. Jude Medical, Inc. (NYSE:STJ), a global medical device company and an international leader in the development of therapies for the treatment of chronic pain, today announced FDA approval of the St. Jude Medical Axium™ Neurostimulator System for dorsal root ganglion (DRG) stimulation. The approval of DRG stimulation in the U.S. will ensure access to a superior therapeutic approach for treating moderate to severe chronic intractable pain of the lower limbs in adult patients with complex regional pain syndrome (CRPS I and II). The chronic pain disorder known as CRPS often affects the extremities. St. Jude Medical expects that DRG stimulation will be available to physicians and patients in the coming months. According to the Institute of Medicine, chronic pain affects more than 100 million Americans, an incidence rate which outpaces heart disease, cancer and diabetes combined. Neuropathic pain represents one of the most prevalent yet under-treated forms of chronic pain in the U.S., with an estimated one in every 10 adults over the age of 30 suffering from the condition. 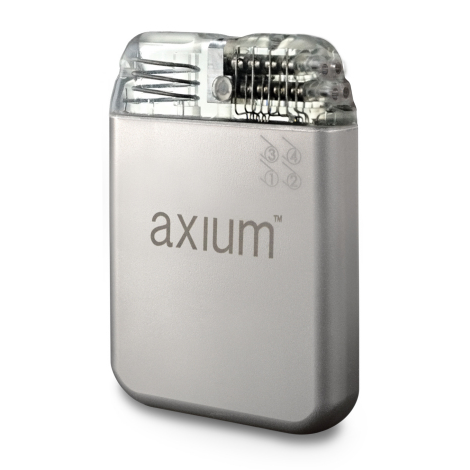 By stimulating the DRG, a spinal structure densely populated with sensory nerves that transmit information to the brain via the spinal cord, the St. Jude Medical Axium system delivers a form of spinal stimulation that gives physicians the ability to treat the specific areas of the body where pain occurs. As a result, DRG stimulation is a first-of-its-kind therapeutic approach that provides pain relief to patients with neuropathic conditions underserved by traditional SCS who have tried multiple treatment options without receiving adequate pain relief. The Axium system originally received CE Mark approval in November 2011 for the management of chronic intractable pain. The Axium system is also approved for use in Australia. Chronic pain affects approximately 1.5 billion people worldwide, more than heart disease, cancer and diabetes combined. The condition can negatively impact mood, personal relationships, work productivity, and activities of daily living. St. Jude Medical is the only medical device company that offers multiple solutions for patients to manage debilitating chronic pain, including spinal cord stimulation (SCS), dorsal root ganglion (DRG) and radiofrequency ablation (RFA). St. Jude Medical is also a pioneer in developing cutting-edge deep brain stimulation (DBS) technologies for the treatment of movement disorders. St. Jude Medical is a leading global medical device manufacturer and is dedicated to transforming the treatment of some of the world’s most expensive epidemic diseases. The company does this by developing cost-effective medical technologies that save and improve lives of patients around the world. Headquartered in St. Paul, Minn., St. Jude Medical has five major areas of focus that include heart failure, atrial fibrillation, neuromodulation, traditional cardiac rhythm management, and cardiovascular diseases. For more information, please visit sjm.com or follow us on Twitter @SJM_Media. This news release contains forward-looking statements within the meaning of the Private Securities Litigation Reform Act of 1995 that involve risks and uncertainties. Such forward-looking statements include the expectations, plans and prospects for the Company, including potential clinical successes, anticipated regulatory approvals and future product launches, and projected revenues, margins, earnings and market shares. The statements made by the Company are based upon management’s current expectations and are subject to certain risks and uncertainties that could cause actual results to differ materially from those described in the forward-looking statements. These risks and uncertainties include market conditions and other factors beyond the Company’s control and the risk factors and other cautionary statements described in the Company’s filings with the SEC, including those described in the Risk Factors and Cautionary Statements sections of the Company’s Annual Report on Form 10-K for the fiscal year ended January 3, 2015 and Quarterly Report on Form 10-Q for the fiscal quarter ended October 3, 2015. The Company does not intend to update these statements and undertakes no duty to any person to provide any such update under any circumstance. 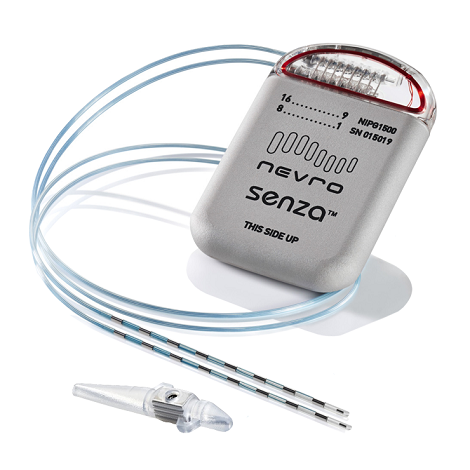 Neuromodulation has been used for decades to treat chronic pain. Yet despite its widespread adoption, limited published, prospective, long-term evidence about the efficacy of traditional spinal cord stimulation (SCS) existed. Nevro understands the critical importance of clinical evidence in today’s environment and has produced world class evidence to advance SCS therapy. No other company has committed so fully to establishing clinical evidence of the safety and efficacy of SCS treatment and no other SCS technology has the wealth of clinical study data to back its technology. THE FIRST MULTICENTER, PROSPECTIVE, RANDOMIZED, CONTROLLED PIVOTAL STUDY OF AN SCS SYSTEM. HF10 therapy was labeled superior to traditional SCS due to the rigor and outcomes of the SENZA-RCT. The study demonstrated superiority at all primary and secondary endpoints vs traditional SCS. HF10™ therapy delivered superior back pain and leg pain response. HF10 therapy delivered superior reduction in both back pain and leg pain at all measured time points. HF10 therapy is the only SCS therapy indicated as paresthesia-free.